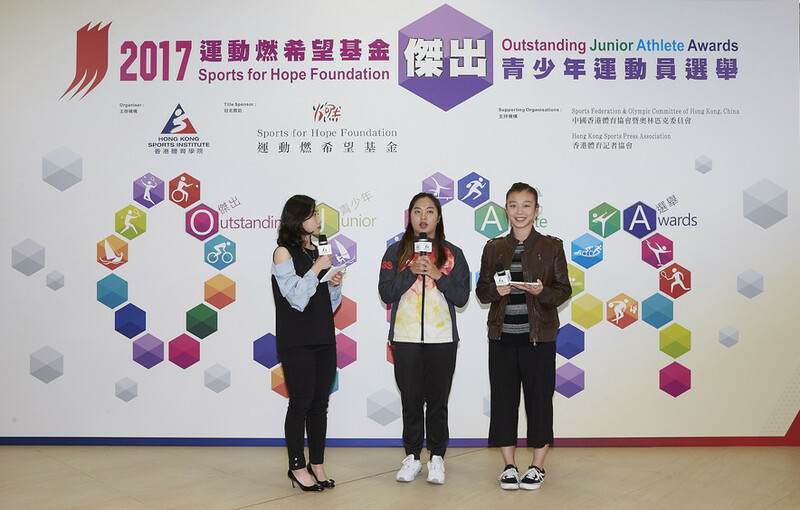 Organised by the Hong Kong Sports Institute (HKSI), the Sports for Hope Foundation (SFHF) Outstanding Junior Athlete Awards (OJAA) presentation ceremony for the 3rd quarter of 2017 took place at the HKSI today. A total of 26 junior athletes were awarded for their outstanding performance in this quarter. Officiating guests included Miss Marie-Christine Lee, founder of the SFHF; Mr Pui Kwan-kay SBS MH, Vice-President of the Sports Federation & Olympic Committee of Hong Kong, China (SF&OC); Miss Chui Wai-wah, Committee Member of the Hong Kong Sports Press Association (HKSPA); and Dr Trisha Leahy BBS, Chief Executive of the HKSI. The recipients were Lo Sum-man and Tang Yu-hin (Karatedo), Hong Kong Youth (U19) Korfball Team, Nicholas Bezy (Sailing), Chan Sin-yuk, Cheng Nga-ching, Ho Ka-wing and Lui Hiu-lam (Squash), Ho Nam-wai (Swimming), Chan Ho-wah and Chan Yee-shun (Table Tennis), Yue Ching-ho and Zhang Zhengqi (Tennis), Oscar Coggins (Triathlon), Leung Pui-hei and Mak Cheuk-wing (Windsurfing), and Ng Tsz-chung and Michelle Yeung (Wushu). Michelle Yeung from Wushu could never forget the 9th Asian Junior Wushu Championships held in South Korea, where she won four gold medals in Changquan, Daoshu, Gunshu and Group Exhibition. She recalled,” From preparation until the election, and then from the training ground in Chongqing to the competition in South Korea, I stayed extremely focused and followed the instructions from the coach. Although I was very tired after training sessions, I watched the playback of my trainings and competitions over and over again because I want to find out my weaknesses and improve.” Her teammate, Ng Tsz-chung also won four medals at the same Championships and became one of the awardees of this quarter. He would share the joy with his family for being supportive in his sporting life. 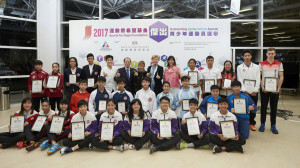 In addition, Chu Tsun-wai and Lee Sze-wing (Cycling), Chu Wai-chi and Ma Hok-him (Dancesport), Jasmine Claire Farrer and Lo Man-hei (Finswimming), Chan Cheuk-yee and Kho Tai-chi (Golf), Yue Wing-suet (Life Saving), Wong Cho-ying (Swimming), Lui Ching-nam and Wong Cheuk-yin (Taekwondo), and Jason Ng Tai-long Hardcastle (Triathlon) were awarded the Certificate of Merit for this quarter. 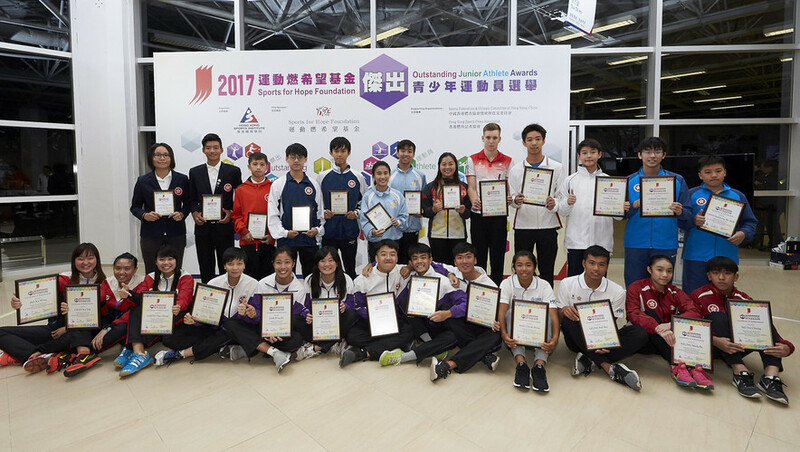 To appreciate the hard work of other qualified junior athletes, the Certificate of Appreciation were presented to Duncan Gregor (Sailing) and Leung Chung-yan (Table Tennis – Hong Kong Sports Association for Persons with Intellectual Disability). Organised by the HKSI and sponsored by the Sports for Hope Foundation since 2012, with support from the SF&OC and the HKSPA, the OJAA recognises the achievements of outstanding local junior athletes under the age of 19 on a quarterly basis. Each recipient is presented with a cash prize of HK$2,500, a sports voucher worth HK$2,500 and a certificate. For teams, they will receive a cash award of HK$10,000, a sport voucher worth HK$10,000 and certificates. The HKSI is the Government’s elite sport training systems delivery agent and is committed to provide an environment in which sports talent can be identified, nurtured, and developed to pursue excellence in the international sporting arena and to inspire potential athletes to pursue a full-time sports career.